Note: TeamSnap Live! is a feature available on our paid team plans. If you're on the Free plan and want to take advantage of this great event chat tool and many other super duper paid features, you can upgrade at any time! Thanks to TeamSnap Live!, you can follow every game and communicate with the whole team, even when you can’t be there! Unexpected business trips, staying home to watch the dog, even getting lost at sea … nothing will prevent you from staying in touch with your team (though if you’re lost at sea, be sure to keep your phone dry). Not sure what TeamSnap Live! is? Check it out! 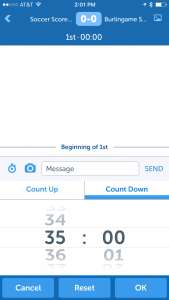 First thing’s first: make sure you have a TeamSnap account and the latest version of TeamSnap on your Apple or Android phone. 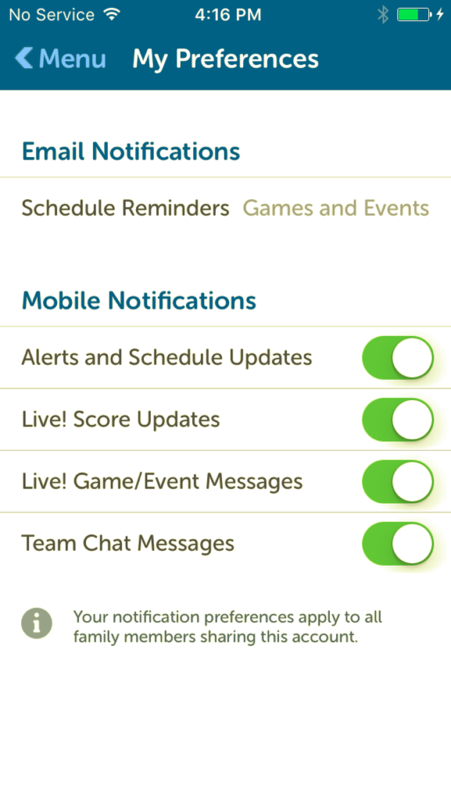 Also, make sure notifications are enabled for the TeamSnap app. To update Notifications, tap More, then My Preferences. Toggle the switches for Live! Score Updates and Live! 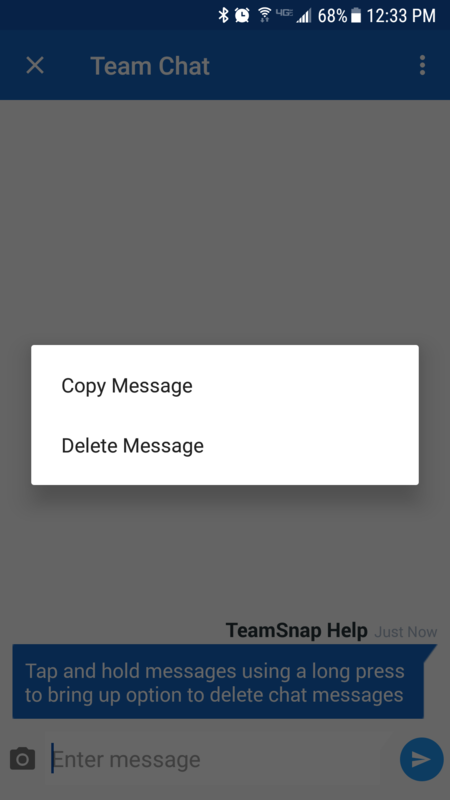 Game/Event Messages on. Under Mobile Notifications, tap to toggle the switches for Live! Score Updates and Live! 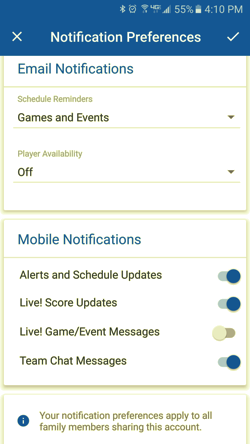 Game/Event Messages on. Learn about the baseball-specific tracker. Learn more about the timed-period sport tracker (soccer, football, basketball, competitive paintball, etc.). TeamSnap has partnered with Fantag to bring real-time video highlights to TeamSnap Live! Fantag's technology makes capturing highlights from live video possible with just a tap of a button. The easy-to-use interface will be tightly integrated into TeamSnap to give coaches, players, and parents instant access to record, tag, and share highlight videos. Read more to post video highlights in TeamSnap Live! 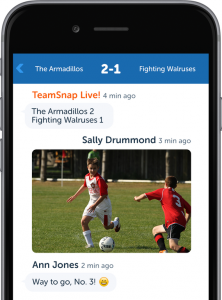 To allow for pre and post game/event commentary and continuing conversations about the game or event, TeamSnap Live! is set to go live 1 hour before the scheduled start time for games and events until 2 hours after the event if there is an end time entered. If no end time has been set, the event will stay live for 5 hours after the event start time. To record points scored during a game, click the light blue scoring box in the top banner. This will activate the score pop-up box. Click the box under the team that scored, toggle to the correct score, and click the large check to enter the score. The score will update to the overall game score and a notation will be made in the chat for the game. You can access TeamSnap Live! archives for a specific event by going to the past game under the Schedule tab. Scroll down to Game Day to see TeamSnap Live! then tap to see archived chats. To disable TeamSnap Live! for your team or across your whole sports organization, you'll need to contact TeamSnap support.